From Budapest to Amsterdam, and many exciting stops along the way, you’ll be immersed in the culture of Central Europe in a unique way on this timeless river cruise vacation. Your river cruise adventure begins with visits to three of Europe’s vibrant capital cities: Budapest (Hungary), Bratislava (Slovakia), and Vienna (Austria). A Local Guide will show you the must-see sites in each city and you’ll have plenty of time to explore on your own. See the famous Heroes’ Square in Budapest, stroll through Bratislava’s Old Town with its winding streets and bronze sculptures, and stop in a classic Viennese café for a decadent treat. 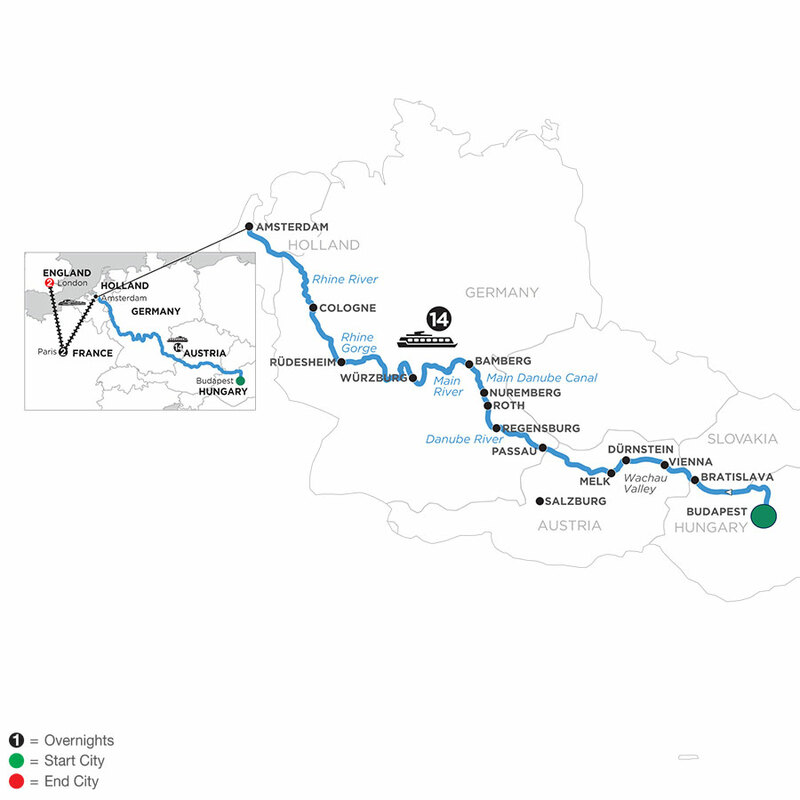 Sail through the picturesque views of the Wachau Valley and the dramatic Rhine Gorge. Visit Melk’s magnificent Benedictine Abbey and Würzburg’s baroque Bishop’s Residenz. Enjoy a tasting of Wa-chau wines. Explore quaint towns like Dürnstein with its blue and white baroque Stiftskirche, Passau, known for its narrow cobblestone streets and the stunning St. Stephen’s Cathedral, and Bamberg, with its town hall straddling the River Regnitz. Enjoy guided tours in historic Nuremberg, Würzburg, and Regensburg-one of Germany’s best preserved medieval cities. In the charming Rhine Valley town of Rüdesheim, enjoy a stroll through its famous cobblestone Drosselgasse lined with shops, restaurants, and lively taverns. Straddling both sides of the Rhine River is Cologne, Germa-ny-a 2,000 year-old city known for its gothic architecture. Here, enjoy a guided walk and see its famous twin-spired cathedral. This European river cruise would not be complete without a visit to Holland’s lively cap-ital of Amsterdam. See the treasures of this 700-year-old city from a unique perspective-on a canal cruise along the elegant grachten. 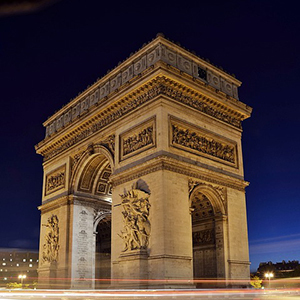 Travel via high-speed train to Paris, where your Monograms vacation in Paris and London begins, including guided sightseeing and helpful onsite support from expert Local Hosts® in both these exciting cities. A unique Suite Ship®, the Avalon Panorama was the first of its kind in the industry with two full decks of suites featuring a Wall-to-Wall Panoramic Window that transforms the living space into a unique Open-Air BalconySM. As you cruise along Europe's finest rivers, enjoy the fresh breeze and enchanting scenery from the comfort of your suite. With 200 square feet, the Panorama SuiteSM is more than 30% larger than the industry standard, and it gives you the unparalleled opportunity to wake up each morning facing the magnificent passing scenery. Exciting onboard amenities include complimentary computer use in public areas and Wi-Fi access, a well-stocked library, a Fitness Center, and a spacious Sky Deck with premium lounge chairs, shade system, whirlpool, and delightful Sky Bistro. There's no better way to cruise in Europe than in the spacious comfort offered on the Avalon Panorama.